Pakistan's President Musharraf has ruled out military action against a rebellious radical mosque in the heart of the capital, Islamabad. Gen Musharraf told the BBC that the authorities could not send forces in for fear of reprisal suicide attacks. 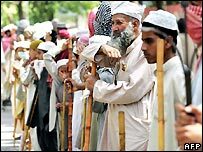 The Lal Masjid (Red Mosque) has been openly defying the government for months, resulting in a tense stand-off. In recent days, thousands of armed police have been surrounding it after students kidnapped a number of police. The kidnappings were the latest in a series of bold challenges to the authority of President Musharraf by the mosque and male and female students in seminaries attached to it. Officials have tried to appease the mosque and its students with talks and concessions, saying they do not want to use force against the women and in a holy place. But critics have attacked the government for failing to enforce its authority in the capital city. President Musharraf made his remarks in an exclusive interview with the BBC's Urdu service. Asked what the government planned to do about the mosque, he said: "How can we take any action? They have weapons and are also prepared to carry out suicide attacks." He accused the mosque's students of being indoctrinated to defend it at all costs. Earlier, Pakistan's interior ministry had also made clear there were no plans to launch an operation against the mosque. "Everything will be resolved peacefully through dialogue, and we will use force only as an absolute last resort," Interior Ministry spokesman Brigadier Javed Cheema told a news conference. The mosque and its seminaries hit the news when its students launched a morality drive in Islamabad. Tensions escalated sharply after a number of policemen were kidnapped in recent days. Three policemen were taken hostage on Monday, but released shortly afterwards. Two others are still being held after being kidnapped last week. The mosque's cleric says the policemen will be freed when the government releases students detained in recent weeks.